If last night’s Twitter traffic is any indication, I missed a hell of a party. That’s to be expected. I’m home in Seattle, while the party in question — that for the release of Jim Meehan’s The PDT Cocktail Book — was, obviously, in New York, the way many of the parties I’m really envious of missing seem to be. Okay, details: there are more than 300 recipes in this book, all sourced from assorted manifestations of PDT’s menu. There are a few familiar classics of the Monkey Gland and French 75 variety, but where Meehan’s book not surprisingly shines is in its wealth of contemporary recipes, many from Meehan and his colleagues and associates, for drinks such as the hibiscus-and-tequila Green Harvest; Don Lee’s Rite of Spring, made with pickled ramp brine; and the apple brandy and beer-based Great Pumpkin. 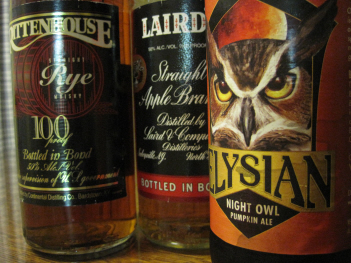 I first tried the Great Pumpkin at PDT three years ago, and I brought a happy, hazy memory of this rich autumnal drink home with me. I got a chance to run a recipe for this drink in the San Francisco Chronicle about two years back, and now that the stores are once again flooded with pumpkin ale –something I have a hard time getting too enthusiastic about, except when it’s a component in mixed drinks such as this one — it’s a suitable time to take a look at the Great Pumpkin again. Combine everything in a cocktail shaker and agitate to flatten the beer (it helps if you add the beer first, then splish it about to drive out all the bubbles so your shaker won’t pop open and spray booze and eggs all over the place). Shake well without ice to fully combine the ingredients, then add ice and shake like hell for 10 seconds. Strain into chilled fizz glass; top with grated nutmeg. * Meehan recommends the pumpkin ale from Southampton; being in the PNW, I went with Elysian’s pumpkin ale, which worked pretty well. The Great Pumpkin has a complexity of preparation that’s pretty much par for the course in the PDT Cocktail Book. While some of the book’s drinks call for bespoke ingredients — from simple preparations like house ginger beer or walnut-infused cognac, to more complicated items such as concord-grape shrubb, or tamarind puree — or for unusual ingredients that can take some work to track down, such as Boiron passion fruit puree or Abbott’s Bitters (though there are replicas now floating about), many of the drinks are relatively straightforward. Meehan frequently calls for particular brands of certain spirits or modifiers, which can be challenging if you intend to prepare that drink exactly according to the specifications, but if you exercise some flexibility with substitutes while keeping the drink’s final flavor in mind, a cocktail enthusiast with a reasonably well-stocked home bar should be able to tackle most of the book’s recipes. And the drinks? Extraordinary. 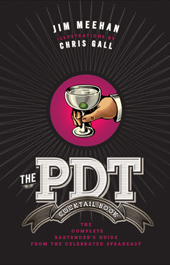 PDT has built a reputation as one of the world’s best bars not just because you have to go through a phone booth to get there and can get a hot dog with your Blood and Sand — the drinks developed by Meehan and his staff, which has included formidable talent such as Don Lee and John Deragon, are big in flavor, distinctive in character and reliably fantastic. Here’s a very simple drink from Meehan that I mixed last weekend, and enjoyed very much: the Platanos en Mole Old Fashioned. Combine ingredients in a mixing glass and fill with ice. Stir well until chilled, 20 seconds or so, and strain into a rocks glass with one large cube of ice. Garnish with a pinch of ground chili. * Did I say be flexible? Zacapa works really well here, but if you absolutely have none in the house but you do have some Zaya lying around, it’ll get you there. 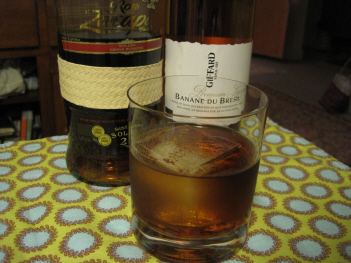 ** More on flexibility—the only banana liqueur I have is Giffard Banane du Bresil, which ain’t too shabby and worked just great in this drink. Anyway, I’m already running behind the release date on getting this post up, so I’ll can further chatter and leave it to you: grab a copy of The PDT Cocktail Book , and if you have particular luck with one or more of the recipes, let me know in the comments section. While these books are gorgeous to thumb through and look great on the shelf, I wish there was a decent cocktail tome for the iPad, which is the reference device I usually have on hand at my (home) bar. Something which has all the luscious visual design of a book like this, but is searchable, annotatable, and perhaps even social. None of the stuff in the App Store seems to fit the bill. James, give Speakeasy Cocktails a shot. It’s very straightforward, and has tons of interactive media. I think you might find it a great compation to the PGT Cocktiail book.